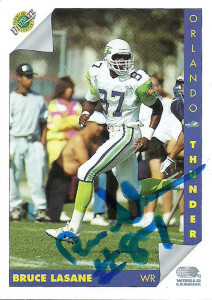 The Orlando Thunder had a stacked offense. At runningback they featured a variety of styles of runners including former Detroit Lion track man Carl Painter. Carl earned his keep primarily on kick off return duties, averaging a league leading 24.9 yards on 24 returns. He set a league single game record when he had 6 kickoff returns for 178 yards against the Knights. Carl sprained his shoulder in a week 8 contest against Sacramento, and finished the season with 15 carries for 47 yards to go along with 13 receptions for 157 yards. Painter played two seasons for the Detroit Lions, after being selected by them during the 6th round of the 1988 draft. Over two seasons, he had 106 yards on 32 carries and 4 catches for 42 yards. He also chipped in 18 kick returns for 361 yards and a 20.1 yard average. A sensational runningback at Hampton, Carl rushed for 3,223 yards from 1983 to 1987, and led the team in scoring in both 1985 and 1987, netting him all-conference honors with the Pirates. In 2009, he was inducted into Hampton University’s inaugural Athletic Hall of Fame. Being that Carl had 2 cards in the vaunted ProSet WLAF 1991 set, I had tried multiple times to get Carl but had lucked out. I have been collaborating with Mark of Mark’s Signing Bonus for some time on tracking down players from the league. Luckily he got a nice hit on Carl, so I sent out to him immediately the next day. Carl wrote me a really nice note, thanking me for remembering him along with the two autographs. As of 2017 he works in management for a city Parks and Recreation department in Virginia. Originally a 10th round selection of the New England Patriots during the 1988 draft, Rodney Lossow earned All Big 10 Honorable Mention as a Junior while at Wisconsin. He’d bounce around with the Los Angeles Rams and Calgary Stampeders, before being selected with the 4th pick of the 4th round during the WLAF offensive lineman draft. 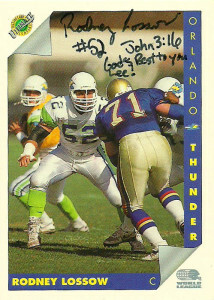 He’d anchor the Orlando Thunder‘s offensive line at Center through their appearance in World Bowl II in 1992. Bruce LaSane hauled in 46 receptions for 731 yards and 6 touchdowns in 3 years for the Seminoles. After graduating from Florida State, the fleet footed LaSane signed with his homestate Tampa Bay Buccaneers as a free agent in 1990. 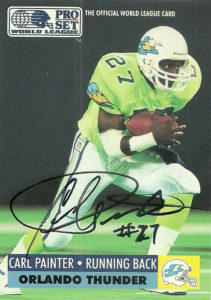 The Orlando Thunder of the WLAF selected LaSane with the 3rd pick of the 7th round during the wide receiver pool of the league draft in 1991. He fit in well with the Thunder’s Run ‘N Shoot offense, pulling in 23 receptions for 333 yards and 3 TDs in 1991. In one of the more amazing plays in league history Lasane caught a Statue of Liberty touchdown pass from Eric Mitchel -after the runningback had fumbled the ball. Bruce joined the Arena Football League in 1992. He played for the Cincinnati Rockers posting 38 receptions for 369 yards and 3 TDs over two seasons. As players went both ways back then in Arena ball, LaSane was slotted in at linebacker and posted 23 tackles. In 1994 he moved on to the Miami Hooters, where he’d post a career high with 58 receptions for 653 yards and 10 TDs to go along with 33 tackles and an interception. -This would earn him All Arena Honors. 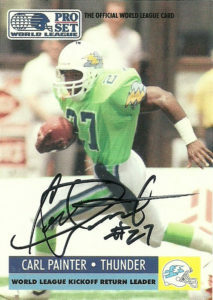 After the 1995 season, LaSane played for the Minnesota Fighting Pike and Milwaukee Mustangs before landing on the Orlando Predators in 1997. He’d help the team win Arena Bowl XIX alongside fellow WLAF veterans Corris Ervin and Pat O’Hara. In 2000, LaSane signed with the New Jersey Red Dogs, but was traded to the Los Angeles Avengers finally retiring after the season. I never thought I’d get this one back. A Spokeo find, I sent to Bruce way, way back in 2011, but the current resident of my old address found me and forwarded this one my way.